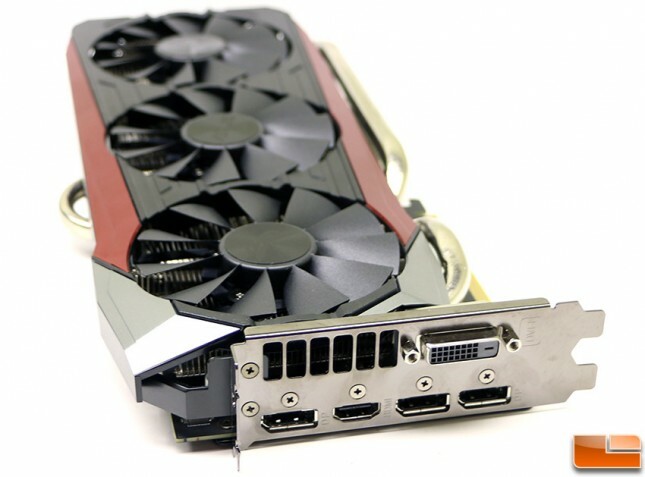 Today we have the pleasure of looking at another AMD Radeon R9 390X 8GB video card that is sold under the part number STRIX-R9390X-DC3OC-8GD5-GAMING. This is the flagship Radeon R9 390X by ASUS as they also offer another model with lower clock speeds along with a different PCB design and GPU cooler. You can better see the differences between the two cards in the table below. For those that might not know… The Radeon R9 290X and Radeon R9 390X share the same 28nm GCN Hawaii GPU, so both have 2,816 Stream Processors and the same overall feature set. AMD bumped up the core clock speed on the Radeon R9 390X by 5% and also increased the frame buffer and memory clock speed. The memory went from 4GB to 8GB while increasing the GDDR5 memory clock speed from 1350 MHz all the way up to 1500 MHz, so the biggest changes were certainly on the memory. AMD claims that the R9 390X is 10% faster than the R9 290X, so it should give a nice little performance boost to a GPU that has been around for a number of years and don’t dare call it a rebrand as AMD is not calling it that. 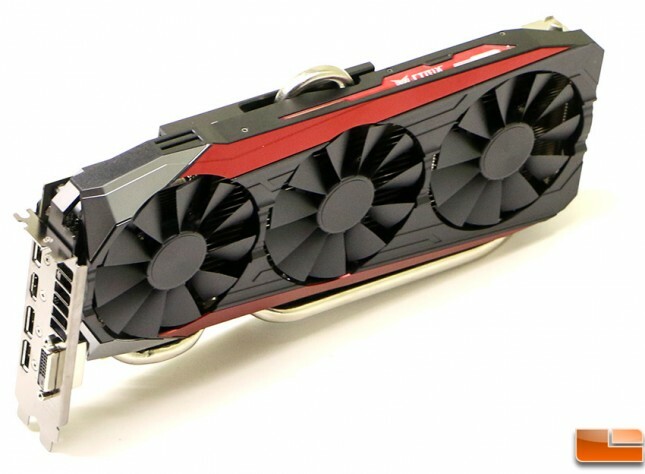 Now that the AMD Radeon R9 390X has been out for several months, the discontinued Radeon R9 290X is starting to get hard to find! Now, let’s take a look at the ASUS Radeon R9 390X STRIX 8GB video card! The first thing that you need to know about the ASUS Radeon R9 390X STRIX 8GB graphics card is that it was designed from the ground up by the engineers at ASUS and is a fully custom card. ASUS went with the DirectCU III GPU cooler that has triple Wing-Blade 0dB fans sitting above a heatsink that has five heatpipes! Two of those heatpipes are 10mm thick and that is an industry-first! ASUS claims that the DirectCU III GPU cooler is up to 30% cooler and 3x quieter than the AMD reference design. The triple Wing-Blade fans deliver 105% static pressure over the heatsink while you are gaming and are silent at idle or when you are playing not too graphically intensive games like League of Legends, Dota 2 and StarCraft. On this particular card the fans are set to engage once the GPU temperature reaches 65 degrees Celsius. 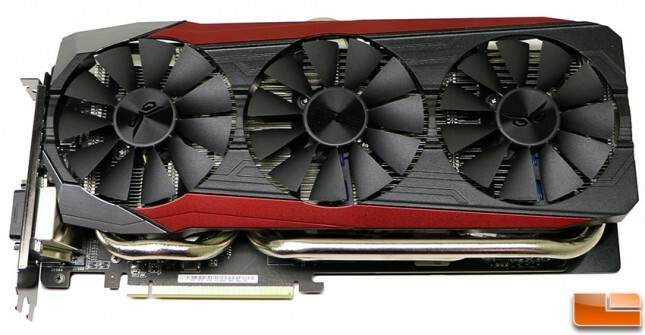 The ASUS Radeon R9 390X STRIX 8GB video card features the usual black design with red accents and measures in at 300 x 137 x 40 mm in dimension. That would be just 10.67-inches in length, so this card is fairly long. 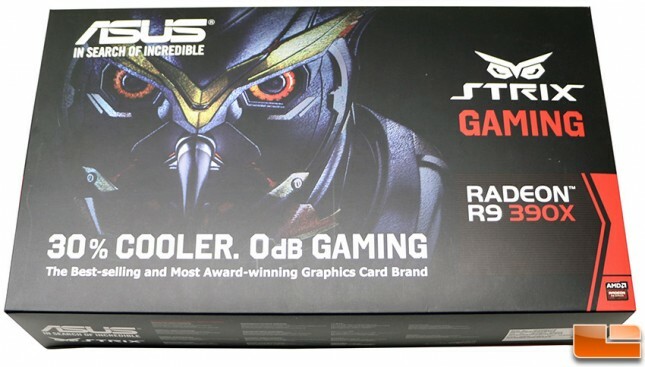 The ASUS Radeon R9 390X STRIX 8GB card features an 8-phase power design with Super Alloy Power II components that should give you plenty of smooth power and minimal choke noise. The last thing any gamer wants when spending over $400 on a video card is component buzzing and choke whine when you are gaming! You can learn more about Super Alloy Power II components on the ASUS landing page for this specific card. When looking at the bottom of the card you can see the two massive 10mm thick heatpipes in the middle of the smaller 8mm thick heatpipes. ASUS went with a full coverage black backplate that is very sturdy on the back of this card. We measured and found that the backplate on this card is spaced about 3.5 mm or 0.14″ away from the PCB by metal spacers. This distance is greater that the backplates on most cards and it might be an issued on some primary PCIe x16 slots on motherboards that have the memory that are right next to the graphics card slot. Our test system uses an ASUS P9X79-E WS motherboard and this card won’t fit in the primary slot, so we had to run it in the next available x16 slot! When it comes to display outputs this particular Radeon R9 390X model has one Dual-Link DVI-D, HDMI 1.4a and three DisplayPort 1.2 outputs. The DVI outputs support screen resolutions up to 2560×1600 and the DP and HDMI ports support screen resolutions up to 4096×2160. There is a high-flow hot air exhaust bracket, but not much air is exhausted out of a case since the GPU coolers aluminum cooling fins are arranged vertically and not horizontally. 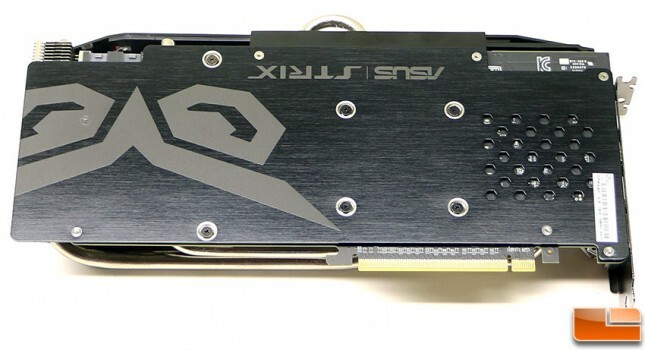 The ASUS Radeon R9 390X STRIX has one 8-pin and one 6-pin PCIe power connector that must be used for proper operation and ASUS recommends using a 750 Watt or larger power supply. Multiple cards can be used for an AMD CrossFire setup and no bridge or interconnect is needed on this card series since all the communication is done over the PCI Express 3.0 bus. If you get a second, third or fourth card you can just enable CrossFire in AMD’s Catalyst Control Center and go about your day. ASUS has LED indicator lights below thje power connector to ensure you connect the power properly. 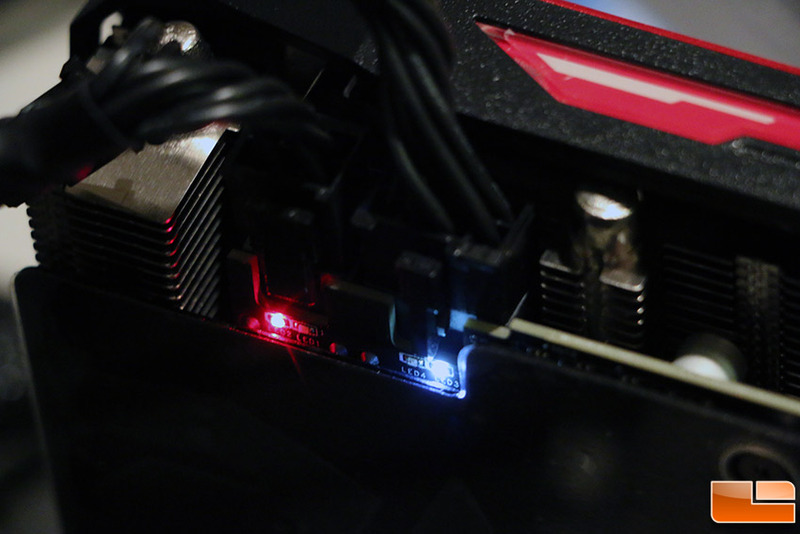 If the LED light is white you have the power cable completely plugged in and it is feeding the card power properly. If the LED indicator light is red it means that you don’t have the power connector pressed in tight enough or there is a power supply issue. The image above shows what what happens when one connector is plugged in correctly and the other is not. In this situation we didn’t have the connector on the left pushed in far enough. When it comes to the accessory bundle you get a 6-pin PCIe power to 8-pin PCie power adapter, a quick setup guide and the driver/utility disc. You do get a 1-year premium subscription to XSplit though! This is a pretty basic bundle for a high-end card, so let’s take a look at the test system and move along to the benchmark results!